SAVE $26! Get all five Round Over and Chamfer bits in our set. Save hours of difficult hand sanding with this innovative bit! At last, the perfect router bit to get into those tight spaces and sharp corners! Smoothly roundover or chamfer your work. These professional grade Carbide Tipped router bits have smooth running 3/16" Diameter Brass Pilots instead of the usual 1/2" ball bearing. 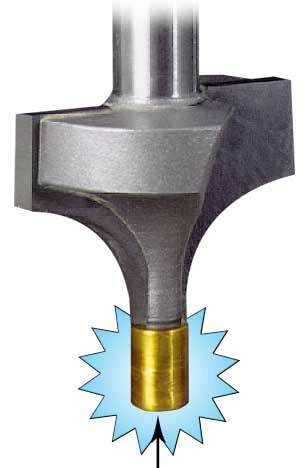 MLCS Brass Piloted Router Bits can save hours of tedious hand sanding or filing and they give a more consistent edge. Great for crafters and high production projects. They’re an invaluable addition to your router bit collection! See the Workbench Magazine Review. "Brass Piloted Bits - Sneaky Smooth" "Bits with metal pilots were around long berfore bearing-guided bits, but you don't see many anymore. That's because the spinning pilots would burn the wood. MLCS revamped the idea with a brass pilot that runs cooler. This small pilot lets you rout into tight spaces and inside corners." SAVE $26! Includes Round Over bits #6600, #6601, #6602, #6604, and Chamfer bit #6612. UNIQUE BRASS PILOT is only 3/16" in diameter (approximately), which is 5/16" SMALLER than a typical ball bearing. The right bit for specialty jobs. Effective when narrow spaces are present. Quick, light touch is required to avoid burning wood. Practice before use on work piece is highly recommended. With the 3 year warranty, the bits are good buys. I have used them successfully with good results. They do indeed require a light touch to keep the brass ferrule from eventually coming off and ruining the wood. I recommend these bits for difficult inside corner work, and with a deft touch, will provide good use. I had to replace only two of the bits under their generous 3 yr. warranty. If you are doing the type of intricate routing shown in the picture, then you have no choice but to use a bit like this. However, these are like the old steel guide bits used before manufacturers started mounting ball bearings. As with those bits, if you apply much pressure on the router, the spinning guide will dig in and/or burn the piece badly. A light touch is needed. Best use is when nothing else is available. THESE ROUTER BITS ARE VERY GOOD WHEN YOU REQUIRE TO GET INTO TIGHT CORNERS LIKE INTARSIA PROJECTS.